This mockumentary focuses on a singer/rapper named Conner4Real (Andy Samberg) whose sophomore album bombs and is left with little career choice than to re-form his old boy band. Imogen Poots plays Conner’s girlfriend, while Tim Meadows (SNL) is his harassed manager, and Sarah Silverman his sarcastic publicist. James Buckley (Jay from The Inbetweeners) makes his U.S. comedy debut as a member of Conner’s entourage. It’ll take potshots at fluffy music documentaries such as Justin Bieber: Never Say Never and Katy Perry: Part Of Me. This is their second movie as a collective, this time co-produced by Judd Apatow. Their last, 2007’s Hot Rod, got a mixed critical reception and flopped but has since become a cult favourite. Co-director Akiva Schaffer subsequently helmed the dreadful The Watch. 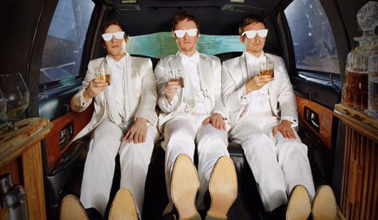 But the music scene is The Lonely Island’s wheelhouse, their spoof albums and videos are hilarious, so this should be their most successful movie to date. Popstar: Never Stop Never Stopping is out in the US on June 3rd. jack Sparrow is the best one. Hot Rod is a great film. Jack Sparrow might be an equal first place finish. Thank you for uploading this. It never gets old! I tell you what else is great La Bibbida Bibba Dum, The Governor’s Broadway song (short version). Nothing to do with Lonely Island, but fantastic anyway. I wasn’t sure what to expect from La Biddida Bibba Dum, but it…surprised me. Going to be stuck in my head all day now. And they say Donald Trump is the scariest Republican! I feel like they won’t get to be as funny in the movie as they can be in The Lonely Island because the joke is so broad, they’re unlikely to have songs that are specific and absurd. We’ll see though.